Fela! is stunning in both senses of the adjective: exhilarating to the point of paralyzing the observer with elation and overwhelming to the point of numbing the observer. Powered – and we do mean powered – by a supremely talented cast of singers/dancers/musicians executing thrilling choreography and song, the national tour settling for one week at the Arsht Center doesn’t just immerse the audience in the riches of African culture, it floods you until you fear you might drown. This fusion of dance recital, musical revue, performance art, stand up comedy, political monologue, everything but traditional theater, focuses on the life of Fela Anikulap-Kuti, inhabited here with indefatigable charm and energy by Adesola Osakalumi. The Nigerian musician turned social activist opposed his corrupt government during the 1970s by writing and performing excoriating protest songs while developing the fresh genre of music, Afrobeat. Many audience members will be propelled into ecstasy by this theatrical rocket fuel; others will rebel at the unrelenting sense of “too much.” One good friend who saw the show in New York hated it, saying that after you saw the first 30 minutes, the show wore out its welcome. Certainly, the overkill will wear out all but the most fervent audience member eventually. But until then, what a ride! The show highlights Fela in 1978 when the government’s murder of his mother has him considering closing his club Afrika Shrine and leaving the ravaged country. In this “last” performance, Fela spiels witty political patter between performances of his infectious percussive music which marries tribal rhythms, American jazz, psychedelic rock and a half-dozen other influences. Most of these songs are autobiographical, enabling the company to illustrate key points in the arc of his life through musical flashbacks. But as the evening evolves and Fela’s outrage grows at the atrocities, his broad smile is replaced by a smoldering glare. He seeks a sign that his dead mother gives her blessing for Fela to leave the country and the cause. 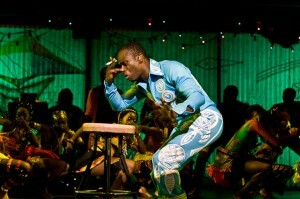 In a flabbergasting coup of stylized stagecraft, Fela journeys into the land of the dead to consult his mother. This pull-out-all-the-stops hallucinogenic fever dream culminates in his mother instilling in Fela the will to continue their work as she sings a heart-stopping aria. The shining soul of the show is Osakalumi’s central portrait of a charismatic artist who merged his music with political activism. But the two real stars of the show are the source music (mostly by Fela, orchestrated/arranged by Aaron Johnson) and avant-garde directorial vision of Bill T. Jones who won the 2010 Tony Award for his kinetic choreography. The music blends disparate elements such as djembe drums from the villages, horn sections straight out of Motown, Cuban conga drums, funkadelic bass and gleefully impudent anti-social lyrics which range from poetic metaphor to scatological jibes. Through it all runs pulsating sexuality. Two of Fela’s international renowned numbers, “Zombie” and Originality/Yellow Fever” are offered here with long, almost hypnotic licks. In a perfect synergy with the sound, Jones has created a dance vocabulary from a dozen disciplines as eclectic as the music. His lithe and muscular corps swivels their hips, pop their shoulders and stoop/strut like kings of the barnyard. Jones imagines human beings can throw themselves into the air and while aloft pivot their bodies at the waist with their limbs flying in different directions like the tendrils of a jellyfish. The tall and slender Osakalumi (who relieved the show’s original star in Broadway) exudes an engaging jocular persona even as he is describing the oppression in his country. He has no trouble seducing an uptight audience into participating in call-and-response chants, standing and even swaying to the music. It’s exhausting just watching him, which is why the role is sometimes filled by Duain Richmond. Yet the most memorable performance comes from a veteran of the British production, Melanie Marshall, as the formidable spirit of Fela’s mother. In the first act, she mostly sings from a second-story catwalk lit from behind, with her mellow sweet voice somehow disconnected from a person. But when Fela journeys to the afterlife to ask her blessing on his retreat, Marshall sits atop a tall metal staircase, cradling Fela’s head against her knees, and issuing forth music that rivals the bright white light she is bathed in. The song “Rain” – one of the few in the show not by Fela –exhorts Fela to persevere despite her death. The way she caresses the words, the way her voice soars in and around the melody scores as one of the most affecting moments in any Broadway Across America tour entry in either Miami or Broward in a few years. She was miked and her voice was pumped out of speakers at a decibel level that likely could be heard on South Beach. But the purity of her sound, her range, her agility, was the equal of anything I heard on the same stage by the Florida Grand Opera this season. If you see the advertising for the show, you might think Fela was being played by Michelle Williams, a member of the R&B girl group Destiny’s Child. But, in fact, she appears 45 minutes into the show as a black power activist who raised Fela’s consciousness during an extended stay in Los Angeles in the late 1960s. Williams does have legit credits replacing other performers in Broadway shows like The Color Purple and Chicago, so she is perfectly adequate in the part, although it could have been done as well if not better by many other actresses. The 10-piece multi-ethnic band is as fine as any singer or dancer on stage, dead solid with an inexhaustible drive. Among the superb group, sax players Morgan Price and Alex Harding “dub” Osakalumi’s playing of Fela’s saxophone; they burn up the stage so completely that they could be prosecuted for arson. Jones and the show’s co-creators Jim Lewis and Stephen Hendel have a consistent vision that extends to their creative team. Marina Draghici’s costumes are a rainbow of styles and vibrant colors. Her setting of the Shrine club with corrugated metal walls surrounded by a second story catwalk is adorned by Peter Nigrini’s projections of Fela’s lyrics, news articles, video clips of strife and hallucinogenic images for the journey through the land of the dead. Coordinated with costumes and setting is Robert Wierzel’s nimble lighting design. Among his techniques is to put people in silhouette, an especially effective tactic when dancing soldiers goosestep across the catwalk. I’d bet, though, several score of audience members would appreciate not having spotlights shined in their face, even if that has several nice metaphorical resonances. Fela has a few failings besides sensory overload. While 85 to 90 percent of the words spoken and sung are in English, perhaps half are intelligible. Osakalumi has a lilting voice whose rhythms and intonations are lovely music itself. But his heavy accent obscures the specific words he’s saying, especially when he gets emotional either from joy or anger. Fortunately, many of his song lyrics are projected on the back wall of the set like opera super-titles. One last observation: The opening crowd was one of the most diverse that a Broadway Across America show has attracted in recent years and the average age was about two decades younger than usual. Along with some family-oriented fare, Fela underscores how Broadway Across America is aggressively reaching out to families and to diverse, younger audiences with an eye for patrons who will still be interested in coming five or ten years from now. If that doesn’t enchant the white senior citizens who formed the backbone of their subscriptions base for decades, well, then, apparently, so be it. Cases in point: Next season, The Arsht will feature the lovely folk musical Once, the impressive War Horse and the time-tested but acerbic Evita. But it will sprinkle the season with a revue based on the music of glam rockers Queen, plus a return of Blue Man Group and for the kids, an adaptation of the movie Elf. The Fort Lauderdale tours will include the supremely irreverent The Book of Mormon, the rock musical based on Green Day’s album American Idiot, the birth of rock n’ roll musical Memphis , with Andrew Lloyd Webber’s new spin on The Wizard of Oz for the family trade and Chicago for a title that audiences have heard of. Not a 1950’s or 1960’s classic in the bunch for the blue-haired set. Fela! runs through Sunday at the Ziff Ballet Opera House, Adrienne Arsht Center, 1300 Biscayne Boulevard, Miami. Performances are 8 p.m. Wednesday-Saturday, 7:30 p.m. Sunday and 2 p.m. Saturday-Sunday. Running time 2 ½ hours with intermission. Tickets are $26-$86. Call (305) 949-6672 or visit www.arshtcenter.org. To see a lengthy promotional video, click here. This entry was posted in Performances, Reviews and tagged Bill T. Jones, Broadway In Miami, Fela, Michelle Williams. Bookmark the permalink.